Dilip Kumar posts a picture of himself and Shah Rukh Khan following his visit to his home in India. 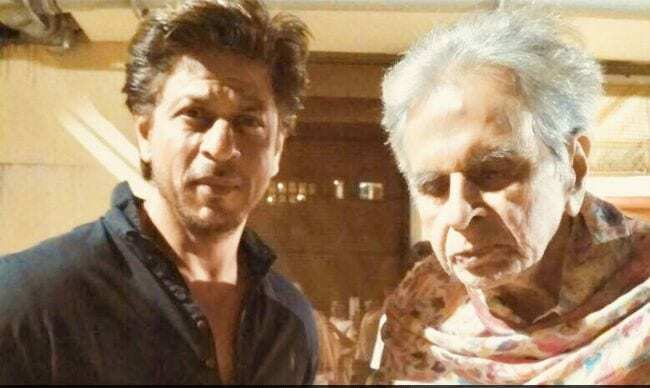 Shah Rukh Khan paid a visit to legendary Bollywood actor Dilip Kumar Monday evening, and a heartwarming picture of the two has already gone viral on the internet. Khan is a regular visitor to many of the past actors of Bollywood, and travels to Dilip Kumar home regularly. The veteran actor of Bollywood cinema looked frail as he held onto Khan’s hand, sending twitter fans into meltdown of this priceless photo of the two stars. The star of movies like ‘Mughal-e-Azam’ was hospitalised in August 2017 after he complained of dehydration. He ended up spending eight days in the hospital, during which he was also treated for other conditions. Dilip Kumar celebrated his 95th birthday in December and appreciated the warm gesture by Shah Rukh Khan. However, we was in the right spirits following the visit of Shah Rukh Khan and posted several tweets about the meeting.